One hot morning, Grug decides to go to the creek for a swim. On his way there, he spots a strange creature lying on a rock. It looks like a dinosaur! The dinosaur chases Grug to the creek, and it follows him. Grug swims across the creek, and so does the dinosaur. Grug sits down for a rest under a tree. But where has the dinosaur gone? Then something falls on Grug’s head. It’s the dinosaur! 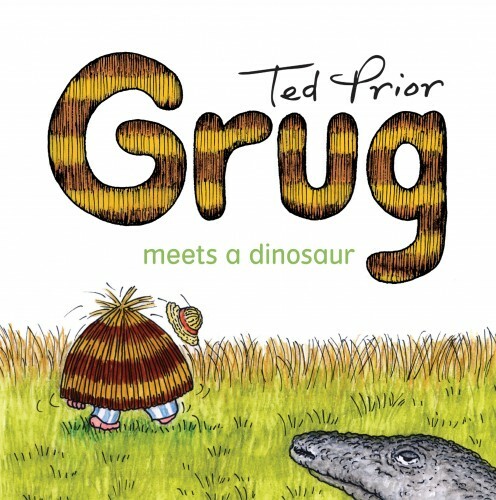 Grug runs, with the dinosaur clinging to him. Grug trips over Cara’s hollow log, and the dinosaur flies off Grug. Cara comes out to see what’s happening. Grug and Cara look at the dinosaur. The dinosaur looks at them. Then it slithers off into the bush. Cara sighs. ‘Just a goanna,’ she says.